Sofia studied pottery in Greece about 35 years ago. She was working as a supplier with bespoke products as well as her own collections. In 2017 she opened her own workshop in London, where she met the rest of her team and established Sofia Ceramics. Her collections were mostly oriented towards usable work of art. The combination of materials from England along with her team’s expertise and know-how formulated a complete and imaginative collection of usable everyday art, such as the plates that are currently supplied to restaurants, houses and hotels. The medium for the creation is clay and porcelain that gains shape and value through the hands of the artist, as well as the discipline and peculiarity of an everlasting material. We are proud of our tableware collection. 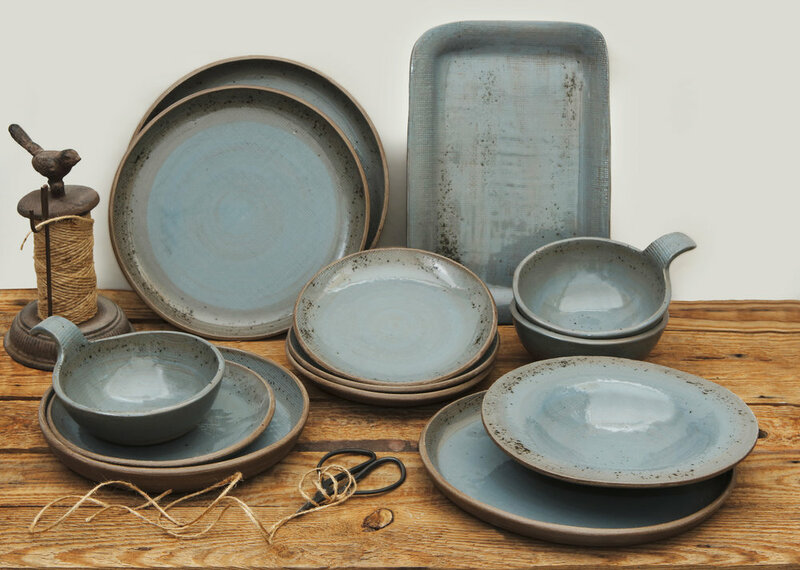 Each of our creations is fired at 1200 C from stoneware clay or porcelain, afterwards they are taken into a special process for the glazing and lustering, to ensure that there is no dripping and no gaps that would affect the final result. We perform a lot of rounds of testing and getting a professional opinion from Chefs we partner with, so we can design a useful, enduring and aesthetic result. This way we are making sure that the plates are not easy to break, they can be used in fast paces and everyday professional use. The glazes do not nick and of course, the plates can be placed in the microwave and dish washing machine. We are always reassured and happy to know they will last for the long haul! Each time our creations were fired, we saw the finalized piece of art with excitement. Then we packaged and shipped them to the person that placed the order. Our thoughts were with them, as they helped us come closer to our goals and expand our workshop and ideas, and for that, we thank our customers as they are a constant inspiration to the team. A lot of our collections are created with several different accumulated techniques and they are considered unique collectors’ items. As they require a lot of work and precision that will not be repeated. Sofia loves making them and always strives to perfect them. The works illustrated below are intended to give you a taste of what the gallery has to offer, please email us on info@cambridgecrafts.co.uk or call us on 01223 361200 to find out which pieces are currently available. Prices range from £24 - £120.